Orta San Giulio is an enchanting village set on the edge of the peninsula which faces the Island of San Giulio. The village has a special atmosphere of calm and tranquillity like no other place on earth, and a wealth of restaurants, ice cream bars, shops and bars, and a fun mini-golf. It's easy to pass the time strolling, having a capuccino or aperitivo, and generally people watching. Walk up above the village to the Sacro Monte, just for the view, or to see the series of chapels with statues and frescos depicting episodes in the life of San Francesco d'Assisi. Take a launch to the Island of San Giulio: the twelfth century Romanesque Basilica on the island has a glass coffin with what's left of Saint Giulio on display, who is supposed to have walked on the lake in his better days. The motor launches in Orta San Giulio are run as a cooperative, web site www.motoscafisti.com. In the past, Orta has hosted a series of monumental sculptures, dotted around the village. In 2008 they were by Pomodoro, and in 2010 by Rabarama. From Orta San Giulio you can follow the path around the peninuslar (full details of this walk are provided in your location pack) right next to the lake. For Villa Gelsomina and the apartments in Vacciago, we also provide directions for the walk down through the chestnut woods to Orta San Giulio. You can swim in the lake from several places on the peninsular, including the little beach at Ortello. In June there are unforgettable evening concerts in the Sala Tallone on the island. Further details of these concerts are on www.amicimusicacocito.it. This event has been running since 1983, so is now an Orta institution. The perfect baroque music among the peace of the island and the packed period room makes it extremely popular, book early! The 2019 dates are Saturday 8th to Saturday 29th June, with concerts on most Fridays, Saturdays and Sundays between those dates. The Sala Tallone is currently undergoing a major restoration, so once again in 2019 (as in 2018) the concerts will be held in Pella (8/6 and 9/6), Palazzo Ubertini in Orta San Giulio (14, 15, 16, 22, and 23/6) and in the Basilica on the Island (29/6). Admire the enchanting Isola San Giulio from the delightful little piazza in Orta San Giulio, where you can sip a Martini soaking up the unspoilt charm and tranquillity of this unique place. The village is full of pizzerias, trattorias, and restaurants - for all tastes and all pockets. Orta San Giulio is not known particularly as a place for night life, but the Piano Bar in the Hotel San Rocco often has live music, and with its superb setting right on the lake can be a great place after a meal, and in fact there are several other enotecas and great bars in the village and nearby. 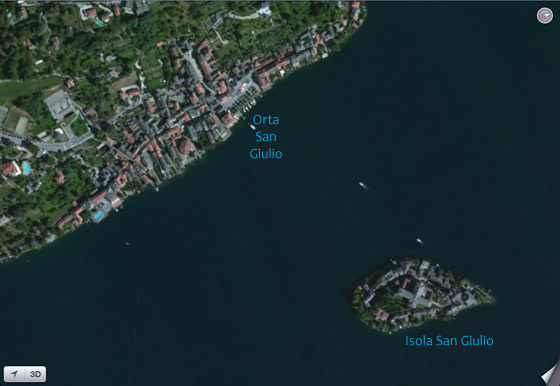 The following apartment is situated right in Orta San Giulio: Isola. 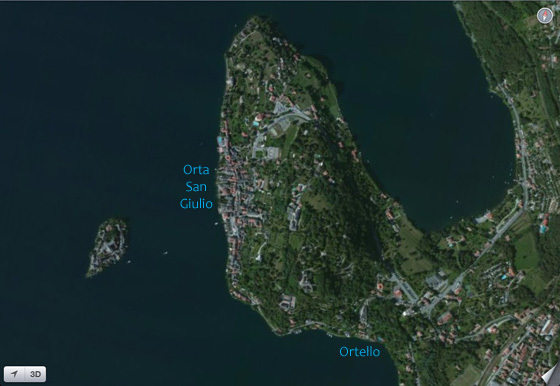 See live webcam of Lake Orta?